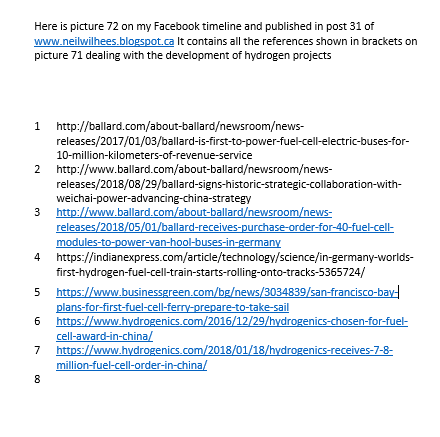 Since it is not easy to find specific points on this blog I decided last year to show pictures with text on my Facebook timeline. I also started tweeting and discovered that a tweetable text page with one or more pictures is very effective. That greatly increased the readership of the blog. 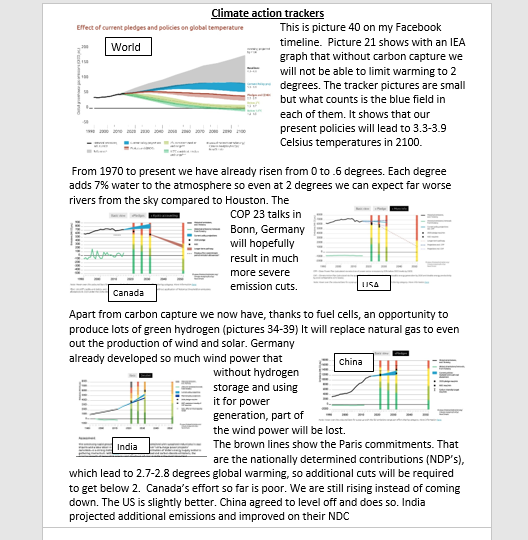 I will use these tweetable pages to show the main points about climate change and required action. 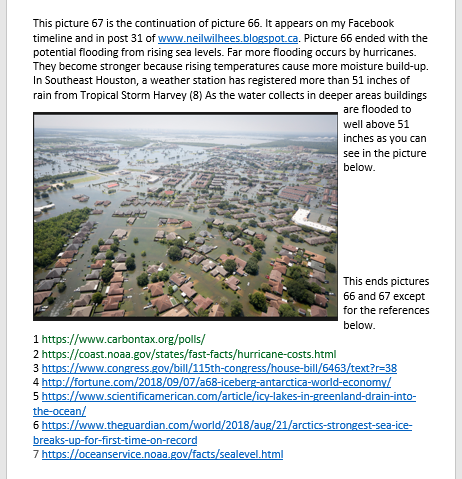 There is little room for references on the pictures so I include them at the end of this post. I only recently saw the devastating effects of methane emissions from permafrost and why we have to reach 0 emissions before 2100. The beginning of this post is therefore more elaborate than the rest. 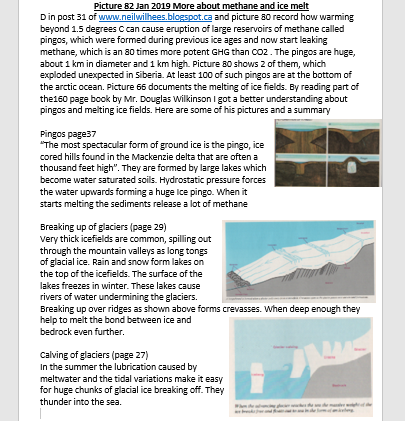 I will try to post each picture close to where it is first referred to in the text points A-Z onwards, like 45 in A. If the picture contains data which are covered by another point it will be referred to by number and letter in the first point where it is shown. 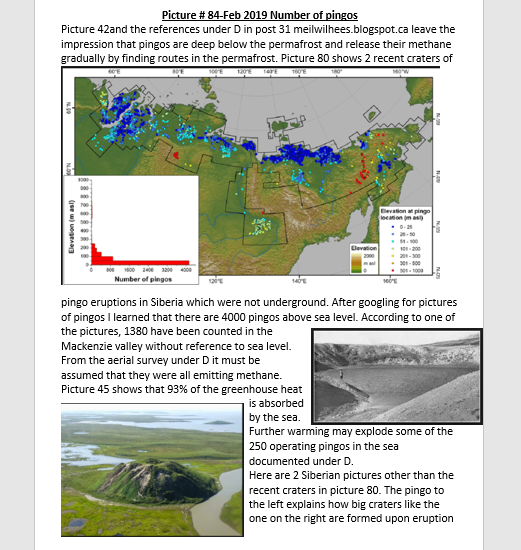 Following the list of references there are more pictures covering some additional points and newly found information. This is covered under Q of post 30. 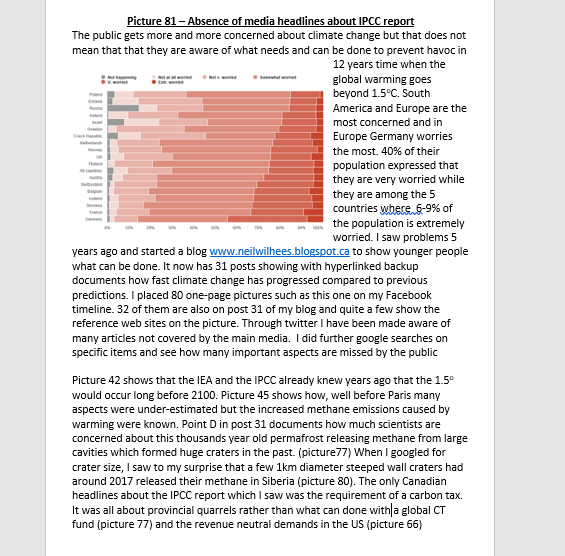 Picture 45 shows that previously the IPCC made 7 major points look much better than reported in Paris. 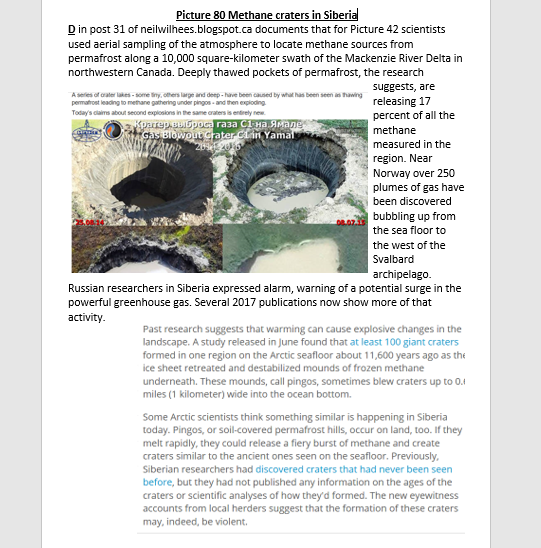 Melting of icefields and methane emissions from permafrost were left out because the scientists could not agree on figures (1) Q in post 30 also describes the findings of Dr. Hanson’s team. Only just recently he showed how warm water currents undermine ice fields. Picture 45 shows that the sea absorbs 93% of all trapped energy, hence accelerates the melting. Most of it is water vapour. 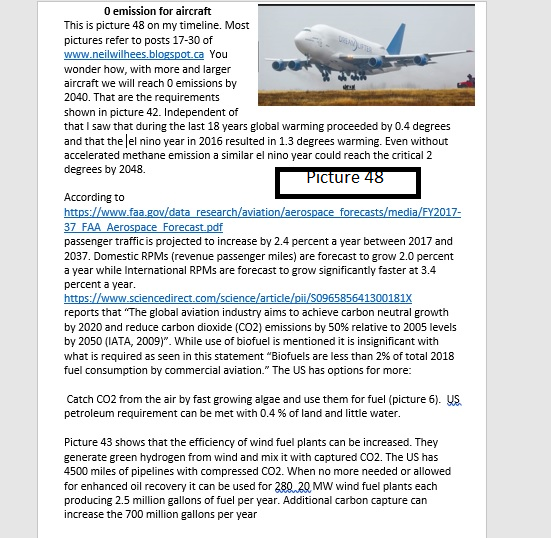 Some people doubt the importance of Carbon dioxide (CO2) because up to 95% can be water vapor making the 5% of CO2 and other gases look insignificant. It is the CO2, methane and a few other gases that create the water vapour. CO2 is therefore the measurement of GHG. Methane is 85 times more potent than CO2 but it breaks down fast. Its 20year global warming potential (GWP) is 85 times that of CO2, dropping to 25- 35 in 100 years. It is measured as CO2 equivalent. (4) Since the coming 20 years are critical, methane emissions should be restricted. Emissions from fracking should be avoided and all efforts should be made to trap cow emissions like Argentina started with fart packs. They extract about 300 liters of methane a day in backpacks carried by the cows. According to the EPA, cow farting (and burping, actually a lot of it is burping) accounts for 5.5 million metric tons of methane per year in the United States — that's 20 percent of total US methane emissions (6) Collecting the methane from all waste will be required. Livestock emissions make up anywhere between 14.5 and 18 percent of total global greenhouse gas emissions. (7). One tonne of nitrous oxide is equivalent to 298 tonnes of carbon dioxide. (8) Cow manure emissions also contain nitrous oxide. (9). 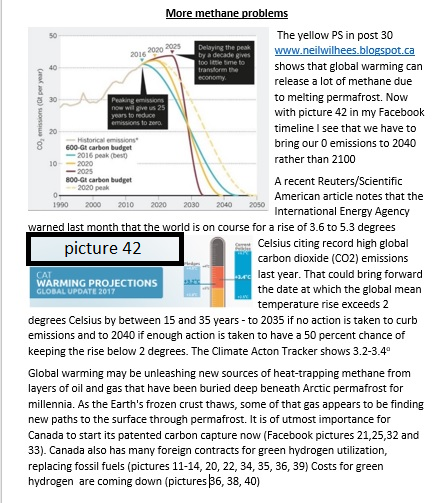 The graph in Picture 42 D suggests that, according to the IEA we will reach the important 2 degrees before 2040 unless we take drastic action. As shown in F) above we had .04 degrees global warming during the last 18 years. That is .02222 degrees per year. Provided methane emissions remain the same it would raise el nino peaks like the present 1.3 to 2 degrees in 2048. 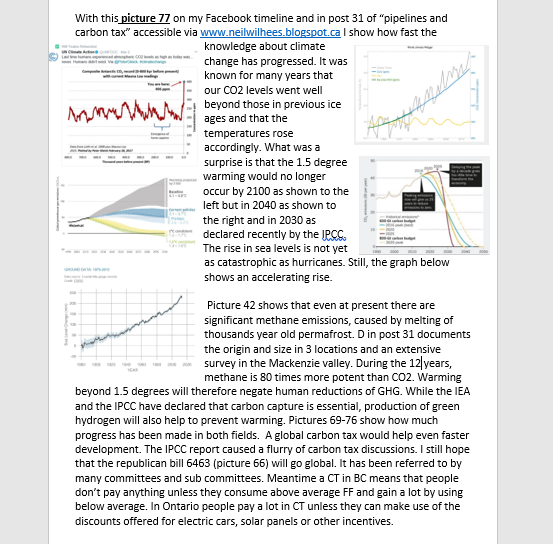 Another source (10) explains that the projections for 2100 are based on the 100 years life of methane while the 20 year figure of 85 times potency over CO2 should apply. 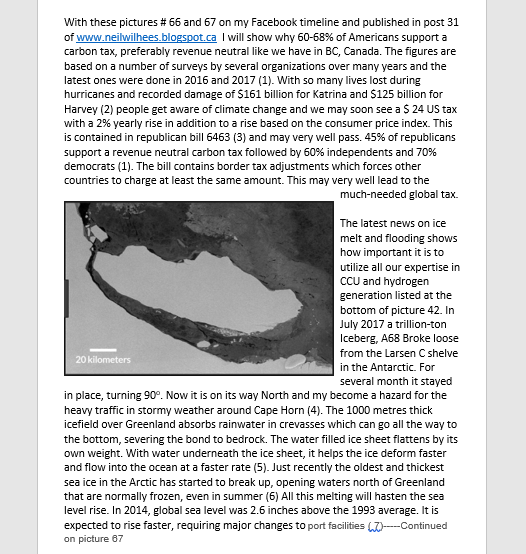 Their warning is: “The world really needs to worry that we are likely to cross dangerous tipping points long before then, including the irreversible loss of enough ice on Greenland and Antarctica to raise sea levels perhaps 40 feet or more”. In Q of post 30 Dr. Hanson explained that during the previous ice age, sea levels rose 9 metres under similar temperature conditions. 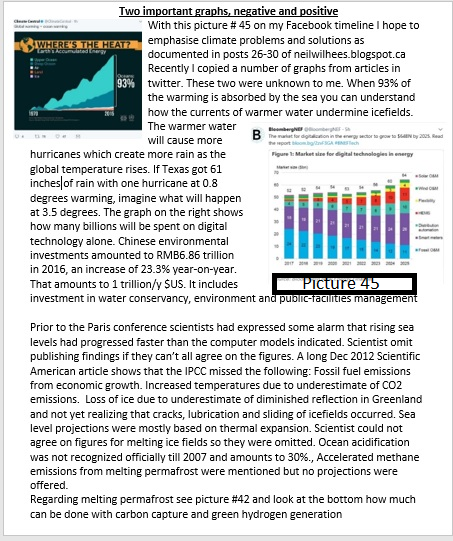 That could be the 3.6-5.3 degrees shown by the IEA. You can see their point. Such fast 0 reductions seem impossible. Fortunately, scientist and industries are working on many technologies other than renewables. In June 2016 the G7 nations signed an agreement to try to come to 0 emissions by 2100 in order to limit global warming to 2 degrees. As shown above, 2050 is a better target. In Paris some 195 countries submitted plans on how they would reduce emissions. For most it covered the first 30 years. More drastic reductions are required to reach the 2 degree target. Progress has been made in renewable energy from wind and solar but far more needs to be done. 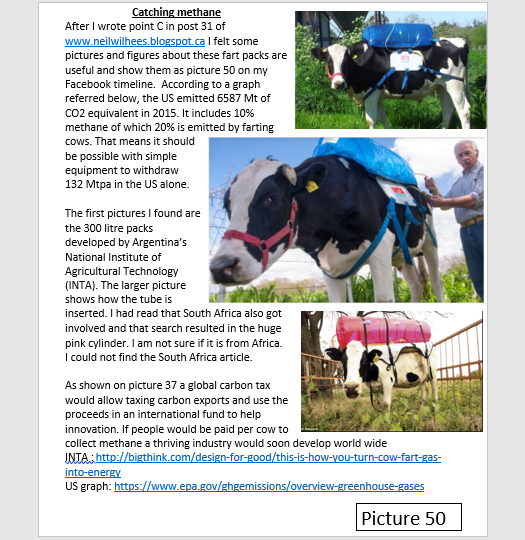 The action trackers on picture 40 shows that present anticipated emissions will result in 3.3-3.9 degrees warming while the committed national determined contributions will require a drop of 40 Gigatonnes of CO2 equivalent and will result in 2.5-2.8 degrees warming. O emissions will result in 1.5 degrees but requires another 30 Gt drop beyond the Paris commitments. Canada and the US have identical Copenhagen agreements, which can’t be met. Both extended the same trend to reach the Paris commitment. The US is doing better than Canada but both countries have to use CCU and hydrogen power to come even close to their commitments. China had in the past a steep increase and agreed to level off. 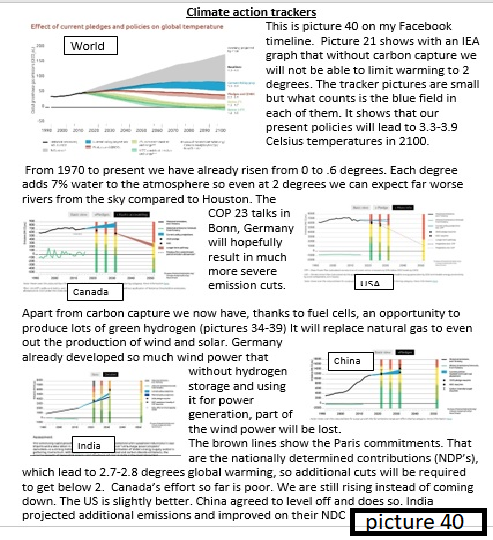 It is expected to achieve it by spending a lot on climate action as shown in picture 45 A. India knew that it could not yet level off and exceed their commitment. There are many stories of phenomenal growth in wind and solar power, so that may be the reason. Recycling of carbon captured from the air. Reforestation is one way to take more carbon out of the atmosphere. It takes a long time and when we let it rot away it releases the CO2. When used to generate heat or power it is therefore a carbon neutral biomass. Algae grown in lagoons grow much faster than forests and can easier be processed into biomass. 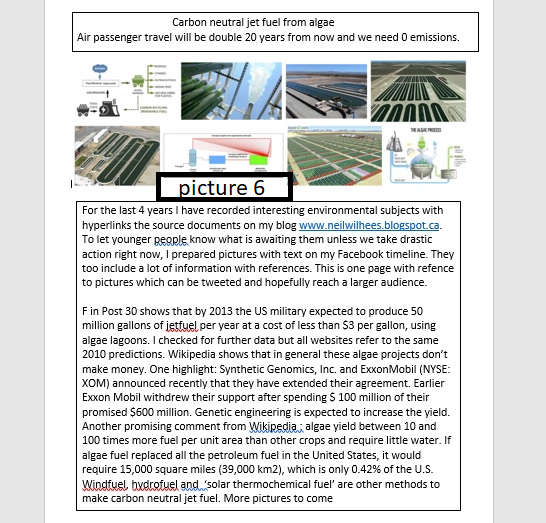 Picture 6 shows that production of carbon neutral jet fuel is quite feasible but costs more than regular fuel. Algae yield 10-100 times more fuel than other crops, requires little water and require only 0.42% of all US land to produce all the petroleum fuel in the US. There are at least 3 plants in operation that capture CO2 from the air. Climeworks in Switzerland has been praised as the first operating plant. The CO2 sells for $400 per tonne, feeding greenhouses. 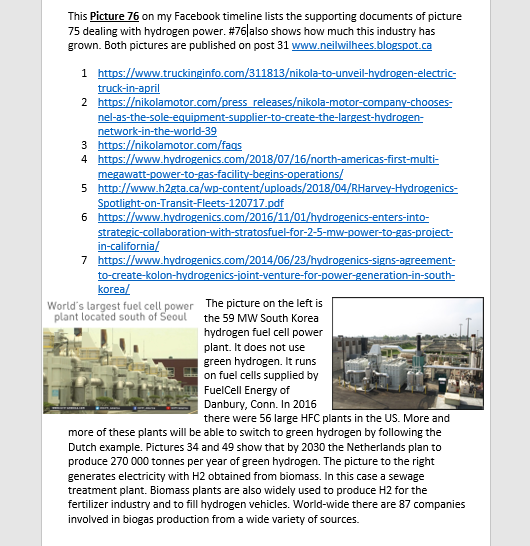 An earlier article (24) gives a review of 3 plants and states that Climeworks captured CO2 is sold to make diesel fuel. 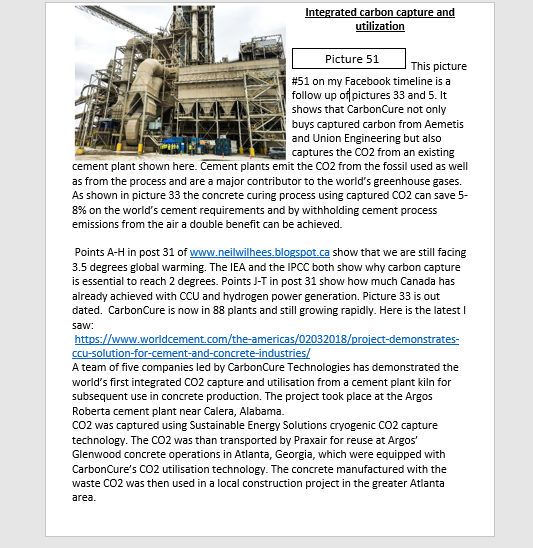 Picture 25 shows the huge Carbon Engineering plant in Squamish BC, Canada. Because it has not yet been in commercial operation it is classified as a pilot plant. It will produce carbon neutral fuel. fertilizers and plastics. Capturing of CO2 from gas wells has proven to be rather cheap. Now I see that the cost of CO2 for the large food and beverage market is coming down. Union Engineering reduced their cost 30% to $ 23 per ton via the Flash CO2 process. It is a refinery process High purity liquid CO2 ( >99,99%) is recovered from the bottom of the CO2 distillation column its pressure can be increased to the required pressure for EOR, Urea or methanol production. Depending on the feed gas quality it might also be partly used as food grade quality. (25,26). CarbonCure’s technology injects carbon dioxide (CO₂) sourced from the refineries of industrial emitters into concrete, where the CO₂ becomes mineralized, thereby enhancing the strength of the concrete. The innovative solution helps concrete producers to lower production costs and make a meaningful contribution toward the global effort to reduce atmospheric CO₂ emissions. Airgas offers concrete producers a complete value-added CO₂ supply and service solution, supported by its large and reliable Gulf Coast distribution network. 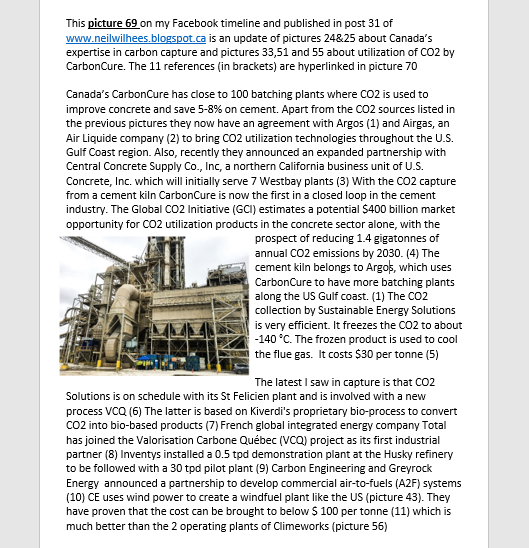 CarbonCure is the world leader in a breakthrough market known as CO₂ utilization, with nearly 100 installations of its technology across North America. The Global CO2 Initiative estimates that CO2 utilization in the concrete sector alone represents a $400 billion market opportunity. 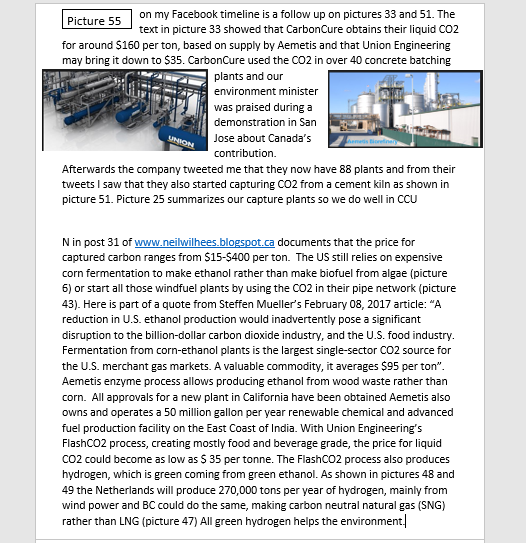 The text in picture 25 K shows that In India, Carbon Clean Solutions operates at $30 per tonne. This is confirmed by the recent merger with Veolia (31). Their own website shows $40 per tonne (32) The 600,000 tonnes per year is a misquote It is 60,000 tpy. Their website has a counter. From 2009 till 25 Jan 2017 they captured 319,039 tonnes. Considering that it captures from a coal fired plant it is quite encouraging. 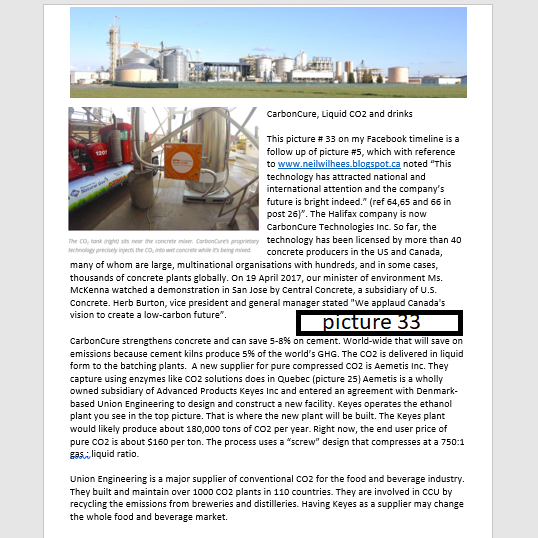 Aemetis, which will produce CO2 for the Keyes ethanol plant shown in picture 33 M is quite clear about the price for the food and beverage industry “Right now, the end user price of pure CO2 is about 8 cents per pound ($160 per ton). 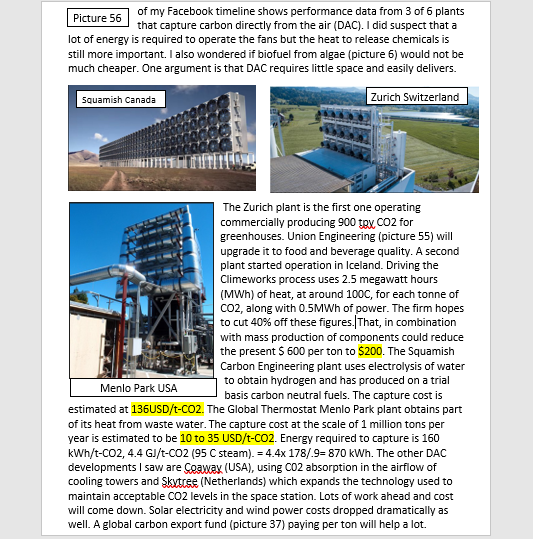 The Keyes plant would likely about 180,000 tons of CO2 per year, with peaks and valleys in CO2 production level based upon the fermentation cycle, and the CO2 plant would convert 110,000 tons (the consistent, base production level from fermentation) into liquid CO2.’ (29) No wonder they asked Union Engineering in N5 above to join them and use their $30 per ton expertise as well. 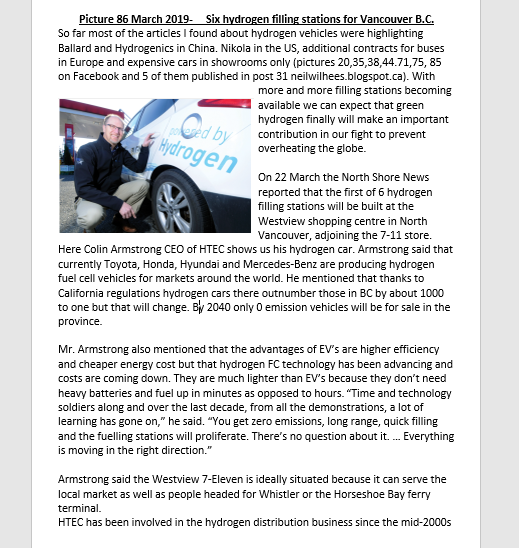 ned about the earthquake danger, hence the push for green hydrogen. 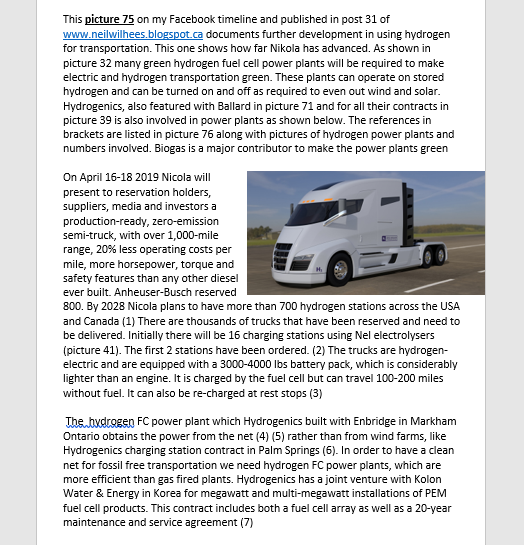 It includes 100 000 tpy hydrogen from biogas. Most of it will be used to feed Dutch and German pipelines, produce ammonia and methanol. The hard to read transportation allotments in thousand tpy are 100 000 cars (12) 1300 buses (10) 50 trains (5) The hard to read utilisation categories are: Distribution of energy throughout regions, buffer to increase system reliance, decarbonize transport and industry energy use, serves as feedstock using captured carbon and helps decarbonizing heat for buildings. Apart from the references in O above there is an excellent article by professor van Wijk, showing many more details (44). It includes the following statement: The total investments for the development of a green hydrogen economy in the Northern Netherlands up to the year 2030 are estimated to be between 17.5 and 25 billion euros. SinoHytec and its partners, including Foton, are promoting a fleet of 150 fuel cell buses in Zhangjiakou, where China will be hosting the 2022 Winter Olympic Games. The completion and delivery of this fleet is expected in early 2018. 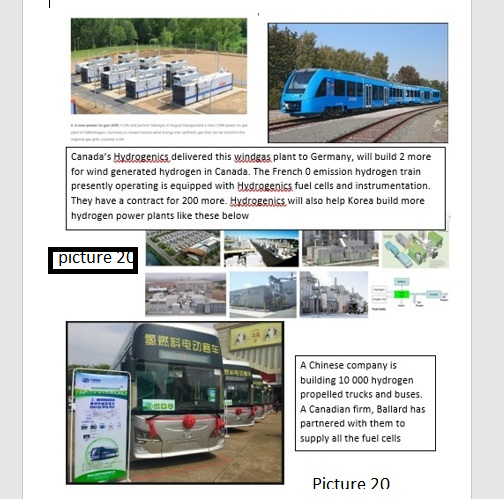 Trudeau had the opportunity to learn more about how Hydrogenics and SinoHytec are working together to jointly address climate change by reducing the carbon footprint related to transportation in China. Bloomberg’s announcement in picture 44 shows a fast increase in EVs. 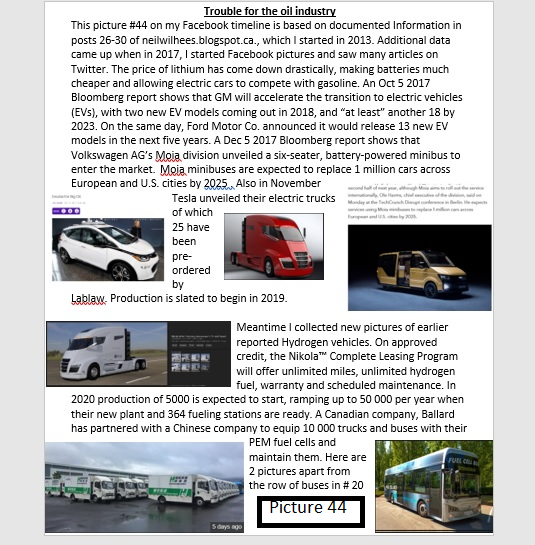 Further details are: “Bloomberg New Energy Finance (BNEF) forecasts EVs will be as cheap as gasoline cars by 2025 and keep dropping in price until EVs overtake them in yearly sales, by which time EVs will be displacing 8 million barrels of oil a day — more than Saudi Arabia exports today”. 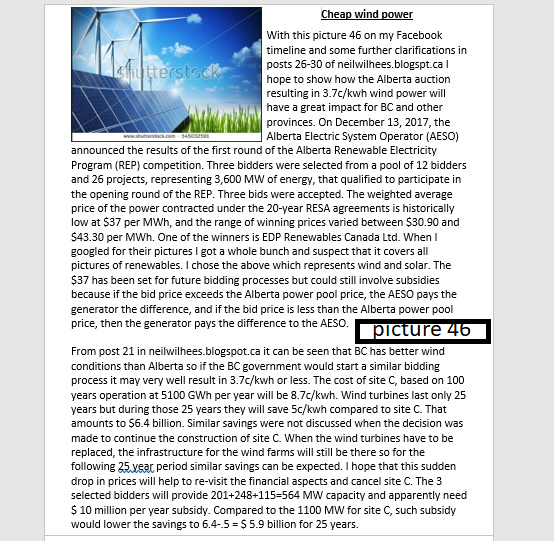 As noted, BC has better wind conditions than Alberta and could get an even better deal rather than spending 8.7c/kwh for site C.
As documented in post 21, and summarized by me in a newspaper (55), BC has a vast surplus of hydro power because the clean energy act requires BC Hydro to buy renewable power from independent power providers(IPPs) even if they can’t sell it. The IPP power is sold via long contracts at a fixed price, ranging from 8.5-9.1c/kwh. It has to be exported at bargain prices. Some power can’t be sold or stored at all and is wasted by having to let reservoirs flow over, driving up the price to 11c/kwh. 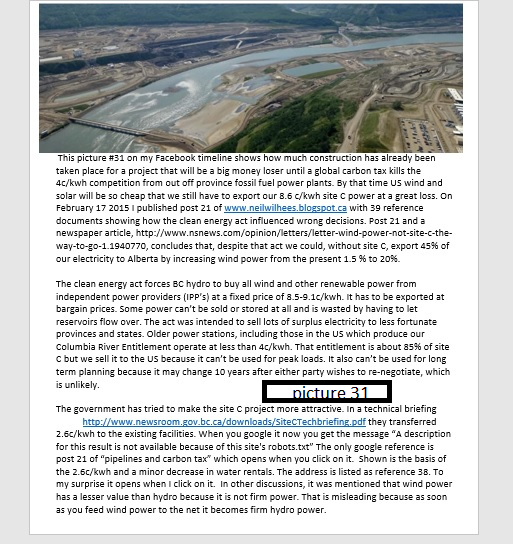 In 2015 when I published post 21, construction had not yet started and I concluded that wind power costs the same as hydro but will come down, did not require public financing and would not destroy an important valley. Still the BC government pushed ahead. Picture 31 shows how much the valley has already changed. Now that wind power costs so little we have the choice of paying several billions in cancellation cost or live for hundred years with a money losing white elephant. 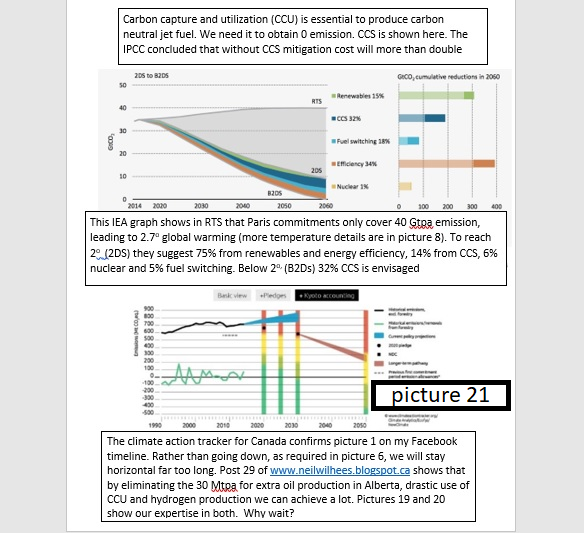 Based on T) above it is quite likely that BC, with better wind conditions than Alberta can reach a 20 year deal for unsubsidized power at 3.7c/kwh and continue to do so for the remaining 80 years. Site C is expected to produce 5100 GWH per year which is 5,100,000 MWH per year. Each MWH represents $87, amounting to $ 0.444 billion per year and $44.4 billion over its lifespan. If we use 3.7c/kwh wind power instead we will save (50x44.4)/87=$25.3 billion during those 100 years. 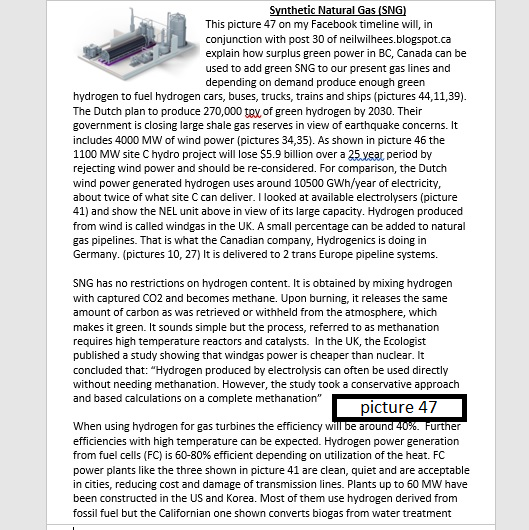 Picture 47 suggest that wind power capacity can be ramped up to twice the site C capacity by following the Dutch example of producing green hydrogen for transportation needs and production of synthetic natural gas (SNG). 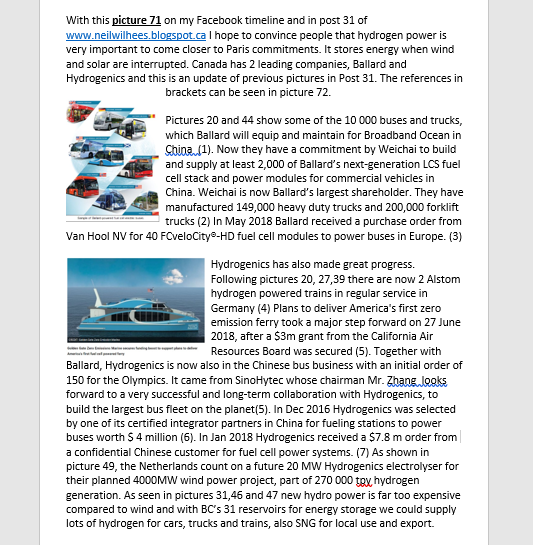 In addition, hydrogen can be used in conjunction with captured CO2 to make carbon neutral jet fuel which is badly needed as explained in picture 48. Unlike the US, BC does not have pipelines full of compressed CO2 but new technologies are a great help. 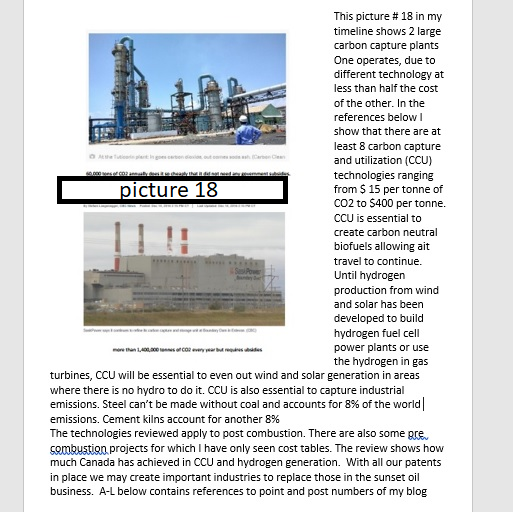 As documented in N 5 above, Union Engineering will be able to produce widely transportable liquid CO2 for $23 per tonne. When hydrogen is compressed to 10 000 psi a tank full holds a lot of energy as recorded for hydrogen cars and the Alstom train. Using SNG instead of regular gas does not only eliminate greenhouse emissions when burning it. At present the BC gas operations release a lot of methane, which is 85 times more potent than CO2. Annual emissions from B.C.’s natural gas industry total around 11.6 Mt CO2e (megatonnes of carbon dioxide equivalent), or about 18% of total provincial emissions. (56). Any contemplated LNG projects will further ruin our chances to come even close to our Paris commitments. 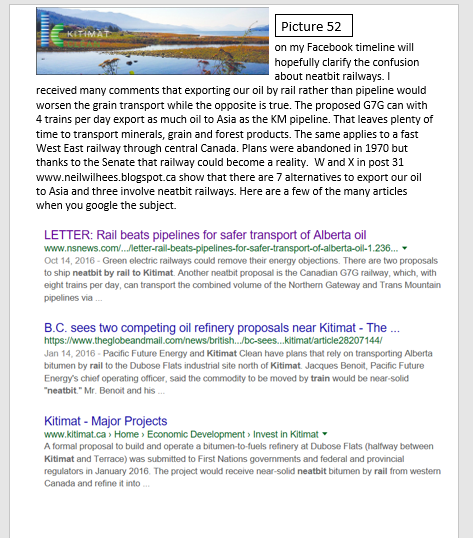 Based on data documented in neilwilhees.blogspot.ca a newspaper accepted my 400 word comment about 7 alternatives for the KM pipeline : http://www.nsnews.com/opinion/letters/letter-rail-beats-pipelines-for-safer-transport-of-alberta-oil-1.2365559 It shows that three will transport unsinkable oil while the 4 others avoid all tanker traffic through BC waters. 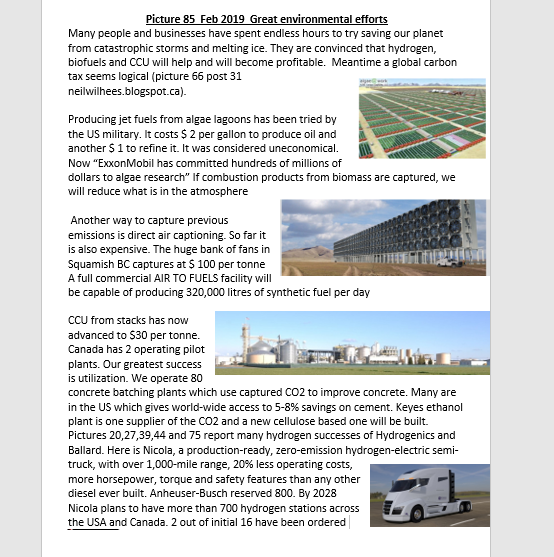 Two of the fully estimated proposals are for refineries which would export finished products from Kitimat refineries and will be among the very few that will capture and utilize the CO2 emissions they create. The third is a huge pipeline which will carry unsinkable syncrude and export it by tanker via Prince Rupert. The Asian super refineries can easily handle dilbit, which is a sour heavy crude. Syncrude and other similar light sweet oils are more expensive but seem essential to diminish the tanker controversy in BC waters. The oil fields have 9 upgraders. Shell, Suncor and Syncrude produce the most (58) Until recently 45% of our bitumen (1.33 bbpd) was upgraded (49). I feel that as part of the KM debates a proper evaluation has to be made about the cost, benefits and risks of all eight projects. Companies have worked hard to show what can be done and little is shown by the main media except KM disputes. At the end of post 1 is a whole list of pipelines concerns. 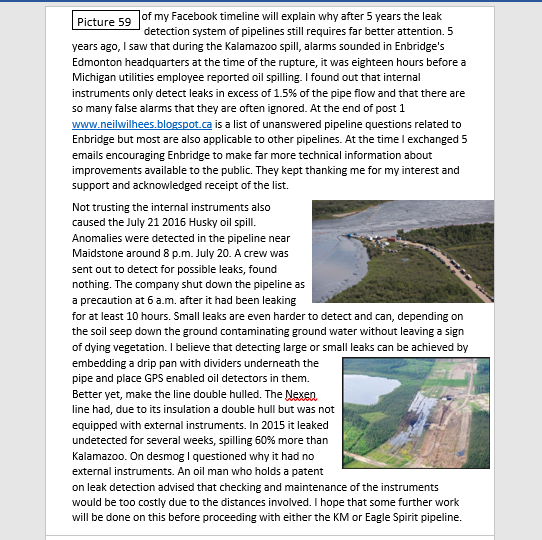 I had a 5 Email exchange with Enbridge in 2013. Enbridge acknowledged receipt of the list. Most apply to all pipelines, some have been resolved but crack detection requirements are still not defined while external leak detection is still considered too expensive. The major recent Nexen and Husky spills show that there is still danger. Far less dangerous than trains loaded with volatile oil traveling on poorly regulated railways causing infernos. 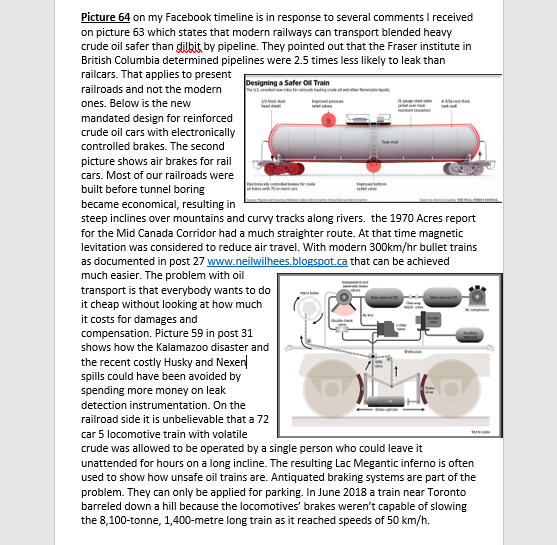 It is hard to convince the public that sending neatbit by train is safer than pipelines, in particular on almost straight new tracks with minimum grades. Here is my opinion based on what I have read and recorded and I hope that a proper evaluation will be made before it is too late. The 3 Northern proposal will not be able to meet the required volumes. While there are a number of icebreaking LNG tankers, only Russia has Icebreaking oil tankers and they are fully occupied with their own oil transport. 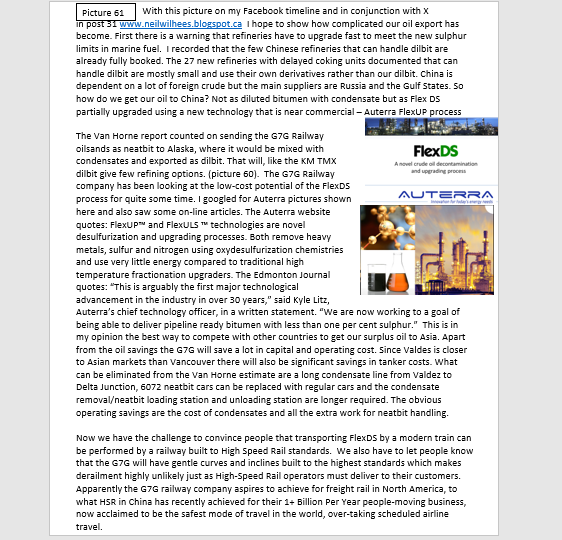 That leaves the $ 16 billion Eagle Spirit pipeline and the $19 billion G7G railway as main contenders. Both can carry more oil than KM, both have support from First Nations and agreements for jobs and prospects of part ownership. At present the pipeline still is subject to the tanker moratorium even though no dilbit is involved. The pipeline problems in post 1 will have to be evaluated and see how much improvement can be made. That also applies to KM. I have not seen a breakdown of capital and operating cost for the pipeline. Those for the G7G are high because the entire rolling stock of 208 locomotives and 6072 insulated cars with heating coils are included based on more than double the KM volume. All bridges and tunnels are estimated for future double track operation. Another cost is a tank farm at Delta Junction, from where the condensates will be added for transport via the existing Alaska pipeline to Valdez. It requires a condensate line from Valdez to Delta junction, which is included in the estimate. The Alaska pipeline is under-used but if, due to tax incentives for its users the volume increases and it can’t handle the Alberta oil, there are other options shown in the van Horne report. Those options are more expensive, but again, considering potential cleanup cost for KM spills it may not be expensive. There are also some savings because Valdez is a few days closer to Asian ports. 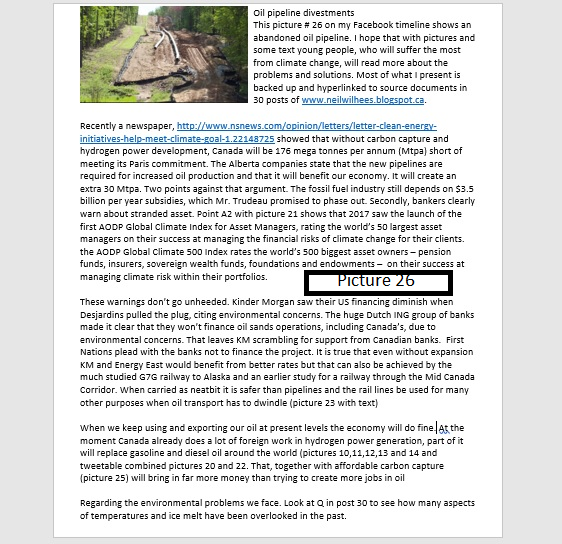 As mentioned in picture 29, the main advantage of the G7G over pipelines is that as demand for oil start dwindling pipelines will lose money while railways can still transport other goods. 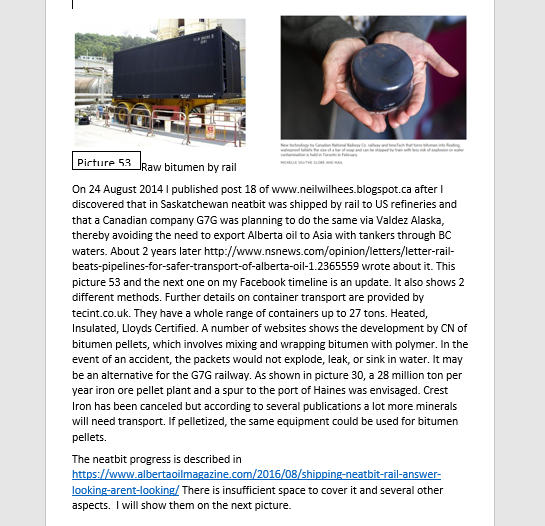 Picture 30 shows the mineral potential, which recently was in the news again. One potential mine was declared unacceptable for environmental reasons while the others are eyed upon for power supply from the expensive site C project. KM’s website shows that the main source of financing comes from 4 Canadian banks. Of the 26 sources 9 of the contributors are Canadian while the 2 Chinese contributors only represent 4% of the committed money. Competing proposals show more enthusiastic Chinese participation. Kitimat Clean Energy: “In April 2013, Kitimat Clean signed a Memorandum of Understanding with the Industrial and Commercial Bank of China which will serve as financial advisor and cooperate in the financing of the project.” “In April, he secured a memorandum of understanding with the Industrial and Commercial Bank of China, China’s largest bank, involving $25-billion in financial backing to build the refinery, a pipeline from Alberta, and provide 10 super tankers to transport the oil to China. He said more deals with Chinese companies are on the way.” Since that time the pipeline idea has been scrapped in favor of neatbit trains from CN. 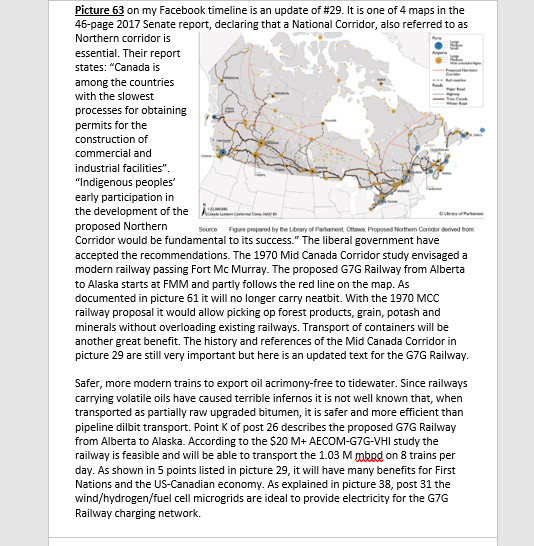 The G7G neatbit railway to Alaska will be 50% owned by First Nations. With 8 trains per day it can carry twice the KM volume. In 1982 the Canadian Constitution was amended by adding section 35 giving First Nations far more say in development of projects. First Nations have now much better access to money for their projects. RBC completed a C$545 million bond issue for the Fort McKay and Mikisew Cree bands - the largest ever private investment by a First Nation - allowing them to buy a 49 per cent stake in a Suncor Energy SU.TO 1.65% storage facility. "The deal was oversubscribed," It's assets that create cash flow," said Joe Dion, Chief Executive of First Nations-owned Frog Lake Energy Resources Corp, which produces 2,000 barrels of oil per day. "We get a piece of the action." Investment bank AltaCorp Capital is raising funds for a $16 billion oil pipeline, proposed to run from Alberta to the northern British Columbia coast. The project has modest financial backing from one of Canada's richest families, the Aquilini Group, and support from 35 First Nations to use their land. In exchange for allowing that access, the bands will own at least 35 percent of the pipeline and a corresponding share of the profits. Major Canadian oil producers including Suncor Energy Inc., Cenovus Energy Inc. and Meg Energy Corp. also want it to go ahead, while investment broker AltaCorp Capital Inc. has been lined up to organize financing. The pipeline’s right of way would be on an energy corridor that would be pre-approved by First Nations to also house gas pipelines, hydro lines and fiber optic cable. That Eagle Spirit pipeline can carry twice the KM volume. Even though no dilbit will be shipped they are subject to the tanker moratorium and have a memorandum of understanding with the Roanan Corporation to move the terminal to Hyder Alaska. HOUSTON--(BUSINESS WIRE)--The International Maritime Organization (IMO) recently confirmed that global refiners and shippers must comply with new regulations to reduce the sulfur content in marine bunker fuels by January 2020—five years earlier than many expected. As a result, both the global refining and shipping industries will experience rapid change and significant cost and operational impacts, according to new analysis from IHS Markit (Nasdaq: INFO), the leading global source of critical information and insight. The fluid cokers are thermal conversion units that crack long chain bitumen molecules into more valuable short chain molecules – heavy gas oil, light gas oil and naphtha. The fluid coking process is a continuous operation where fluidized coke particles are transferred back and forth between the reactor and burner vessels. A portion of the coke produced in this process is transferred to the burner to provide heat for the thermal cracking process. A portion of the coke produced in this process is transferred to the burner to provide heat for the thermal cracking process. Expanding coking capacity in the United States, as well as at a number of other refineries, such as India’s giant Reliance I and II plants at Jamnagar, has supported prices for heavier crudes, even as the premium for light sweet oils has been eroded by soaring output from shale formations, throwing a lifeline to some of the simpler refineries along the U.S. East Coast and in Europe. The Jieyang refinery in China has the highest planned DCU capacity globally with 153 Mbpd during 2018 to 2022. The Jizan refinery in Saudi Arabia has the second highest planned DCU capacity with 104 Mbpd. The refinery is expected to start operations in 2018 with a total capex of $7.0bn. Saudi Arabian Oil Co is the operator for the refinery. Panjin II and Palu refineries are jointly in third for planned DCU capacity in 2022, each with a capacity of 78 Mbpd. The refineries are expected to start operations in 2021 and 2019, respectively. China North Industries Group Corporation is the operator for Panjin II refinery, while PT Palembang GMA Refinery Consortium is the operator for Palu refinery. Duqm I has the fourth highest planned DCU capacity with 52 Mbpd. The refinery is located in Oman and is expected to start operations in 2021. Duqm Refinery and Petrochemical Industries LLC is the operator. The refinery has a total capex of $7.0bn. The Barmer refinery in India has the fifth highest DCU capacity with a capacity of 47 Mbpd. The refinery is expected to start operations in 2022 with a total capex of $6.5bn and HPCL Rajasthan Refinery Ltd is the operator. The remaining refineries with planned DCU capacities are Pulau Muara Besar in Brunei, Aliaga in Turkey, Zhanjiang III in China, and Mostorod II in Egypt. These have capacities of 46 Mbpd, 40 Mbpd, 32 /Mbpd and 25 Mbpd, respectively. - Spain's Puertollano refinery is undergoing a major turnaround from the end of January. As part of the maintenance work on the conversion units, Repsol will carry out work on the thermal insulation of one of the vacuum unit's (55,000 b/d) furnaces, as well as modifying some of the equipment in place at the head of crude distillation unit No. 2. The work also includes the FCC (38,900 b/d) and the coker (24,000 b/d). The turnaround should be concluded around March 20. The company previously said it expected the work to conclude at the end of March. - Poland's Plock refinery is planned to carry out works in the spring involving a CDU, FCC (28,000 b/d), reformer (44,300 b/d) and one HDS (hydrodesulfurization) unit. Gothenburg refinery adding that more maintenance was to come in the first quarter. The company said that in early March it decided to move maintenance work on selected units, mainly the isocracker unit and fluid catalytic cracker, planned for April to March. It did not specify where this work would be but traders said maintenance is affecting the Lysekil refinery near Brofjorden, where there is also CDU and VDU maintenance in Q1. "These maintenance activities are progressing well, and the plan is to have the units back in operation with products to tank from the isocracker on March 18, and products to tank from the FCC on March 22," Preem said. - Gazprom Neft has started construction of a delayed coker at its Pancevo refinery, with a target date for completion of 2019. The delayed coker will have 2,000 mt/day capacity and will help increase the depth of processing to 99.2% and diesel production by more than 38%. The refinery will start producing coke, currently not produced in Serbia. The new refining complex will reduce the high-sulfur heavy fuel oil yield, in anticipation of the new marine fuel regulation that will take effect in 2020,” Total said. Another oil supermajor with a facility at Antwerp in Belgium, ExxonMobil, said earlier this week that it planned to complete the construction of the new delayed coker unit towards early 2018 and would then proceed with the start-up process. The delayed coker unit will be fully operational in the first half of 2018. 2018 will be a big year for Delayed Coker projects. ExxonMobil will complete it’s DCU in Antwerp in early 2018. Construction has started on the Delayed Coker at Serbia’s Pancevo Refinery. PEMEX has plans for a $2.1 billion delayed coker project. Canada’s Oil Consumption was reported at 2,343.25 Barrel/Day th in Dec 2016. This records an increase from the previous number of 2,298.82 Barrel/Day th for Dec 2015. Canada’s Oil Consumption data is updated yearly, averaging 1,800.31 Barrel/Day th from Dec 1965 to 2016, with 52 observations. The data reached an all-time high of 2,382.87 Barrel/Day th in 2013 and a record low of 1,108.12 Barrel/Day th in 1965. Canada’s Oil Consumption data remains active status in CEIC and is reported by BP PLC. The data is categorized under World Trend Plus’s Association: Oil and Gas Sector – Table RO.BP.OIL: Oil: Consumption. While neatbit railways are safer and not much more expensive than pipelines (pictures 53 and 54), that only applies to transporting to upgraders or complete refineries that can process it, The PS of 23 May 2018 shows why Kinder Morgan has no chance to reach the Asian market with dilbit. The same applies to the G7G railway which therefore has been planning to use newly developed Auterra oils. They are light oils with less than 1% sulphur, close to syncrude but at a much lower cost. While China has little capacity to process dilbit they import and refine a lot of oil heavier than the Brent or WTI trading benchmarks. In fact, they recently established their own Shanghai standard against which heavier oils will be rated and traded. Picture 57 shows how Chinese crude imports have grown from 6 million bpd in 2012 to 8.5 million bpd in 2017. Despite increased protests about our exports the world demand is still rising for at least 7 years and will level off for many more years. We may as well go along with the trend rather than letting others create the same quantity of GHG that people are complaining about. When we keep extracting at a soon to be reached 5 million bpd there is lots of export opportunity for blended heavy oils. I will prepare a further PS with picture to document the new developments about the competition. Some politicians and oil magazines still claim that we can make much more money by selling to Asia rather than the US. It is not as much as they think but still worthwhile. 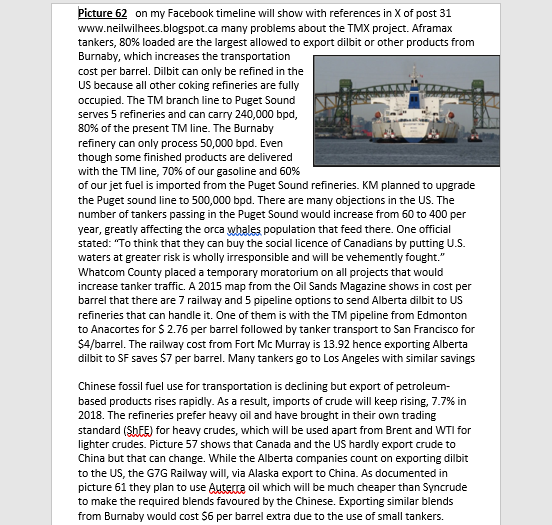 PS 3 and picture 61 in post 31 shows that Chinese crude blends will be in high demand for quite some time and that by transporting them with the G7G railway to Valdez will cost $ 5 less per barrel than with small tankers from Burnaby to Valdez from where the oil has to be transferred to larger, more economical tankers. This PS and picture 62 show with many references why our main crude, WCS is worth far less than what is traded based on Brent and WTI qualities. Chinese refineries have no extra capacity for dilbit but high demand for heavy oil. This PS also has a lot of information about competitiveness and widely varying shipping costs. The $5 per barrel in savings has been increased to $6.20 because the amazingly high tanker cost is based on Anacortes to San Francisco rather than Anacortes to Los Angeles. 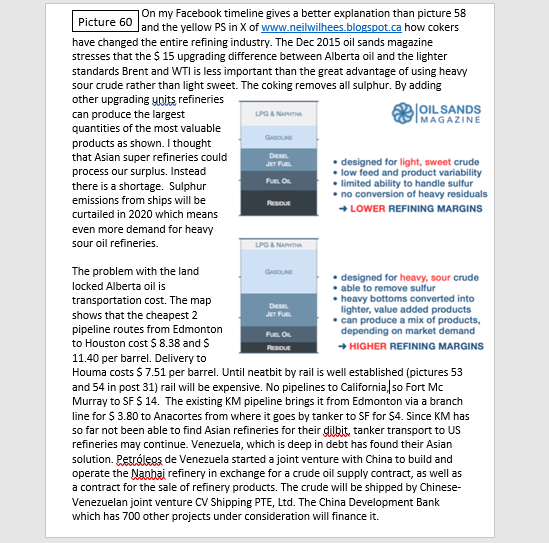 That $ 4.00 is clearly shown on the Dec 2015 Oil Sands Magazine map. That map shows the cost of 14 US pipeline, tanker and railway transportation modes from Edmonton and Fort Mc Murray. There are no pipelines to the West coast but 5 pipeline and 3 railway options to reach the Southern refineries. 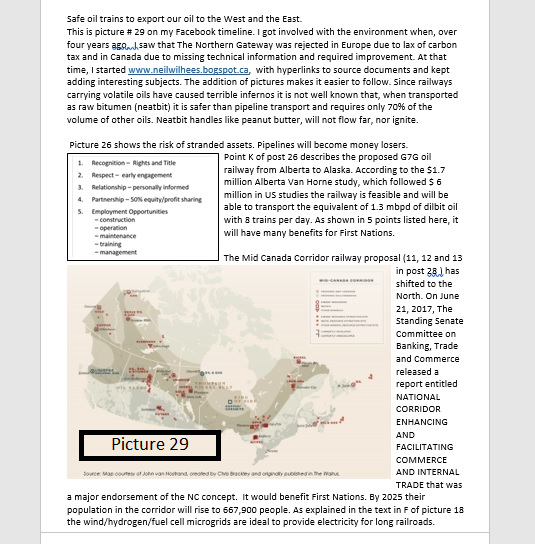 Picture 60 only shows the 3 cheapest pipeline routes which are $7.51, 8.38 and 11.40 per barrel. Our WCS oil costs $ 15 for upgrading to WTI standard so with those transportation rates the present price difference of $24 is not out of line. The demand for Chinese crude blends is according to https://www.platts.com/latest-news/oil/singapore/cnpc-forecasts-chinese-2018-oil-demand-to-grow-27906041 growing 7.7 % in 2018. Even though fossil fuel for cars will soon be banned, the GDP will increase 6% while oil product exports are forecast to surge 30.7% year on year. According to a 1 June article in the Globe and mail “Continued investment in the oil sands generally, and in the Trans Mountain pipeline specifically, means Canada is doubling down on a no-win bet. We’re betting that the world will fail to meet the reduction targets in the Paris Climate Agreement, thus needing more and more oil, including our expensive and polluting bitumen. We’re betting, in other words, on climate disaster. If, however, the world finally gets its act together and significantly cuts emissions, then Canada will lose much of its investment in the oil sands and the Trans Mountain pipeline expansion, because the first oil to be cut will be higher-cost oil such as ours”. 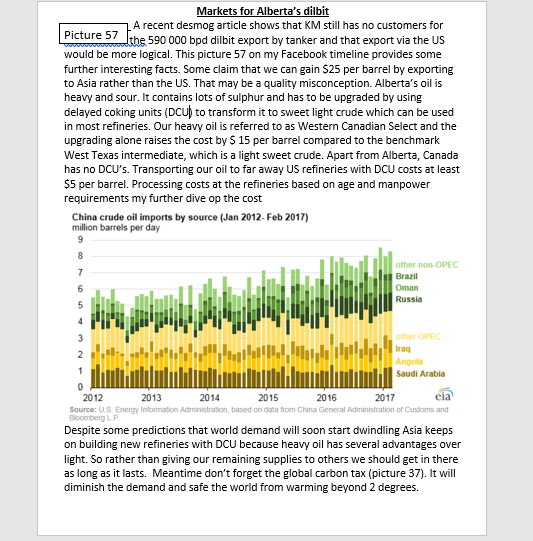 The big advantage of using Valdes as a shipping point for Canadian blends to China can be seen in a January 2016 report: https://www.reuters.com/article/us-usa-crude-asia/traders-eye-alaskan-oil-exports-to-asia-as-shipping-ban-ended-idUSKBN0UM0FM20160108 reported that Oman crude, a Middle Eastern grade similar in quality to Alaska North Slope (ANS), delivered to North Asia on a Very Large Crude Carrier would cost about $30.60 a barrel, including freight. Meanwhile, ANS costs closer to $31.80 a barrel including $3 per barrel in freight costs on a Suezmax tanker, according to calculations by Reuters and trade sources. Alaska North Slope has been at roughly a $3 to $4 per barrel discount to the similar Russian ESPO blend so far this month. Freight costs from the Russian port of Kozmino to South Korea are currently about 80 cents per barrel. Even so, medium-sour Alaskan crude fits well with most Asian refineries that are geared towards processing high-sulfur Middle East crude, dealers say, and shipping time is half the four-week journey from the Gulf. Present spot rates for VLCCs can be seen in https://www.hellenicshippingnews.com/more-scrapping-may-lift-oil-tanker-rates-in-late-2018-frontline-ceo/ “Spot rates for very large crude carriers (VLCCs), with a capacity to transport 260,000 tonnes of oil, have recently dropped to a loss-making $13,000-14,000 per day, far below Frontline’s cash breakeven rate of $21,600”. Since 1 tonne is about 6.9 barrels it amounts to 1,794,000 barrels for $21,600 per day=1.2c per barrel per day. When operating at the quoted loss it will be 0.75c per barrel per day. For the two-week journey the $21,600 amounts to 16.8 c/barrel to reach Asia from Valdez. There must be some more cost than $21,600 because the 16.8 c is unbelievable low. I have not been able to find prices on the Shanghai Futures Exchange (ShFE). but it may be a help for Canada. I also don’t know if there is still that much difference as reported by Dogwood 2 years ago: “In 2016, Asian refineries paid even less than U.S. refineries for comparable blends of heavy crude – as much as eight dollars less per barrel.” I. 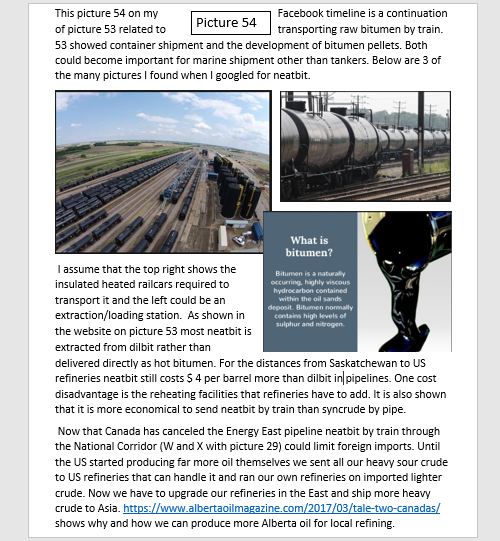 The price difference between our oil and that of the US is well expressed in http://www.oilsandsmagazine.com/news/2015/12/26/how-much-for-that-heavy-oil which states: “Shipping crude oil from Mexico or the Middle-East to the US by tanker is only a few dollars a barrel. 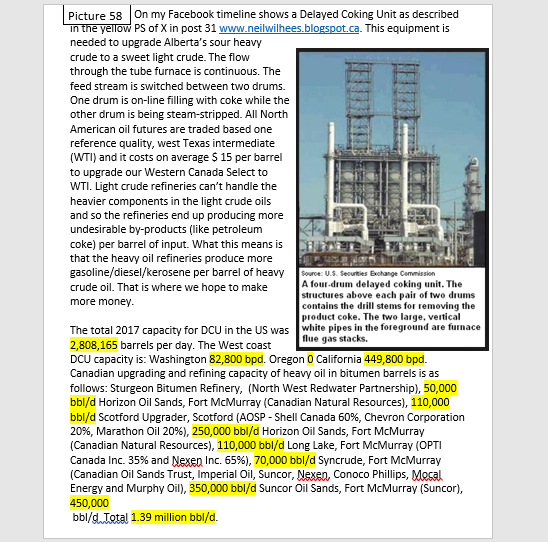 Shipping oil from Alberta to the Gulf Coast by rail or pipeline ranges from $10 to $20/bbl”. notes that there is a chance the local Orca whale population will become extinct by adding 360 tanker exits per year. compared to the present 40. These Orcas feed in the same channels and eat less with so much extra sound. 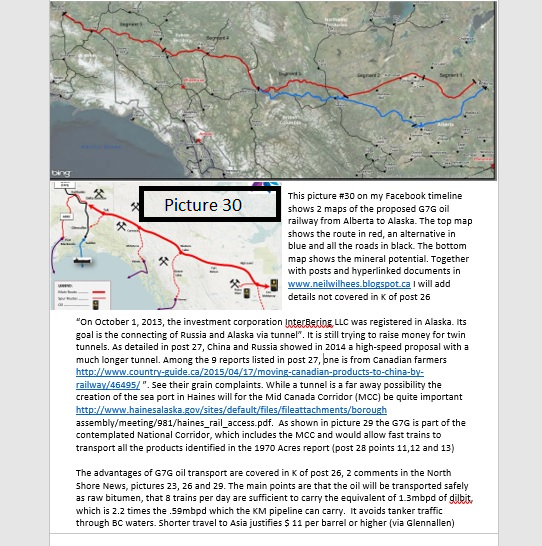 Picture 29 has been updated to reflect transport of heavy crude blends rather than neatbit (pictures 60-62) The original Mid Canada Corridor was a concept developed by Canadian Major-General Richard Rohmer. It would create an East West belt, well away from the US with a railway at its spine. Rohmer convened a conference of 150 business, political leaders and advocates to discuss how the North would be developed A large Engineering company provided many maps and reports on the technical aspect, mining and forest resource locations, soil conditions, climate aspects and significance for First Nations. When Rohmer presented the final report to prime minister Pierre Trudeau at Rideau Hall in 1971, it was refused virtually on the spot. The meeting continued, with Trudeau responding to Rohmer’s arguments with indifference. Leaving Rideau Hall to go to question period, Trudeau was still “testy and agitated”. Great national efforts left their mark the late 1960s, and for decorated Canadian Major-General Richard Rohmer, the changing atmosphere of the 1960s was just what was needed for his expanding plan to move the country North. “The development corridor, as it is envisioned, is a belt that traverses Canada through its mid-North and northern regions, with a railway as its spine,” read a 1967 introductory pamphlet. “Within this belt will grow new towns, new industries, new highways, enlarged ocean ports, new agricultural areas and a new transportation grid for the whole of Canada,” it said. In 1969, Rohmer convened a conference of 150 business, political leaders and advocates to discuss how the North would be developed, what needed to be done, and the imperative of doing it soon. As it planned the future, the conference was determined to “avoid the mistakes of the past — the degradation and exploitation of the true native Canadian peoples, wanton pollution of air and water and indiscriminate destruction of the only pure, virtually untouched region on this continent,” wrote Rohmer in 1970. In a country where First Nations had only received the vote nine years previously, the conference was remarkable for its close involvement and consultation with First Nations peoples. “If we, the white men, who are so impatient to get out the wealth and tame the area, cannot devise ways to involve our native brethren, then we had better stay away until we can,” said a conference participant. The optimism of the conference fell on deaf ears in Ottawa only months later. When Rohmer presented the final report to prime minister Pierre Trudeau at Rideau Hall in 1971, it was refused virtually on the spot. “I think that he thought at the time that I was a Conservative, and that anything we were doing was not worth looking at,” said Rohmer. The meeting continued, with Trudeau responding to Rohmer’s arguments with indifference. Leaving Rideau Hall to go to question period, Trudeau was still “testy and agitated,” wrote Rohmer. So many environmental problems can be solved with a global revenue neutral carbon tax. It would allow people and businesses to decide how to spend their refunds on green projects and make above average gains. 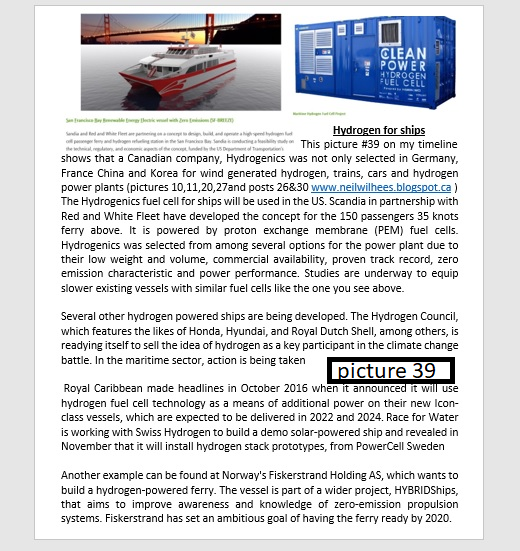 Via a carbon export tax an international fund could pay for CCU and green hydrogen power on a per tonne basis. 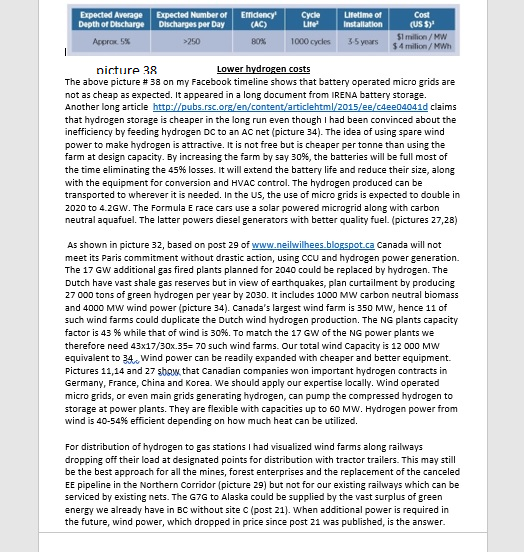 The costs of wind and solar power are already about equal to fossil fuel but, as shown in picture 21 J, CCU is essential. 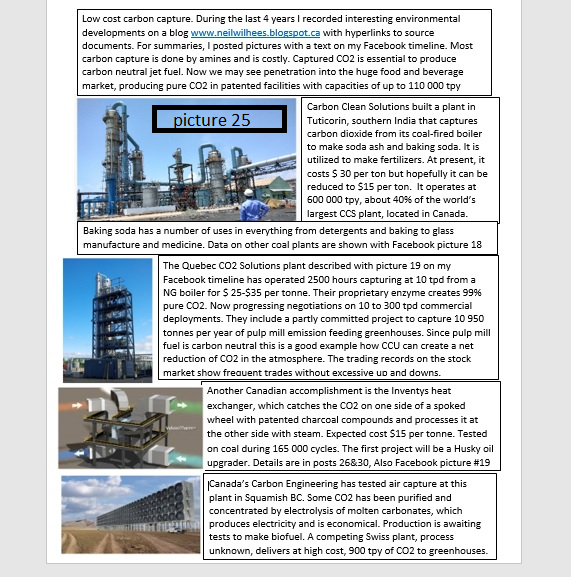 Picture 25 K shows 4 different modern carbon capture plants. Picture 33 M gives an excellent example of CO2 utilization. 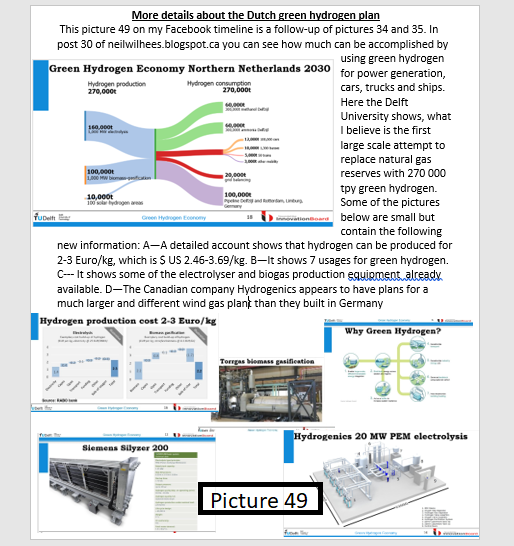 Picture 49 P shows how much can be achieved with green hydrogen. 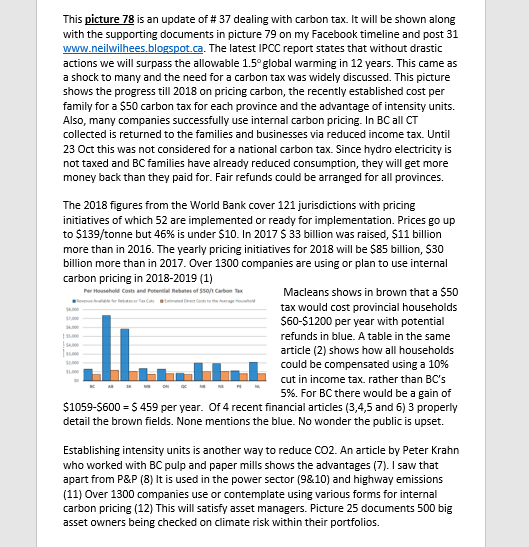 I started reading and recording articles from the US Carbon Tax Center and saw in 2013 that the US had a number of carbon pricing bills. I only looked closer at the Waxman Markey bill, designed to meet the Copenhagen commitment and the Sanders Boxer bill, which is a carbon tax bill. At the same time the BC had its revenue neutral bill. Both the Waxman Markey and the BC bill were contested by powerful organizations, producing completely wrong figures how it would affect families by leaving out all the refunds. It is all detailed in post 1 and we still live with the problem. 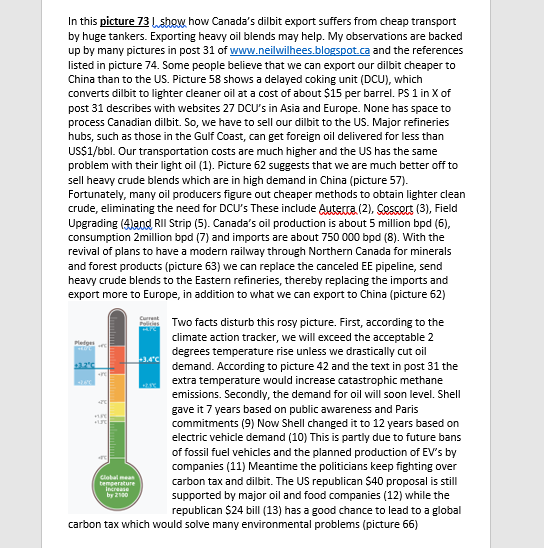 Post 3 shows how much export tax BC could raise when we don’t export our carbon for free. 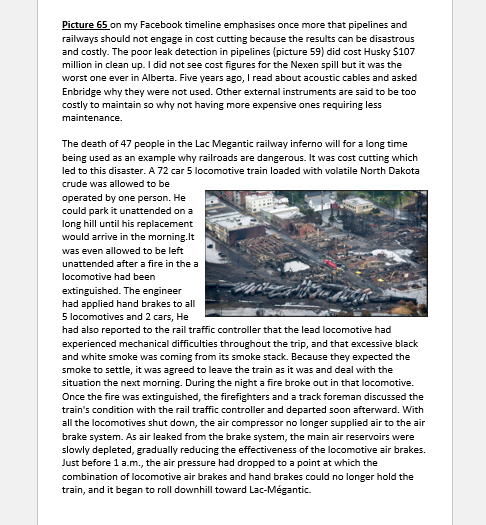 Post 9 reports the losses endured by the European rejection of the Northern Gateway. It was not only about the lack of carbon tax but also the unfair subsidies. When in London, Mr Harper was met by 40 protests groups while 6 MPs signed motions to keep Alberta oil put of Europe. Post 10 stresses again that without taxing, demand for oil will keep rising. We don’t have to cut our production and give our share to others creating the same amount of GHG but hope for a global decline. 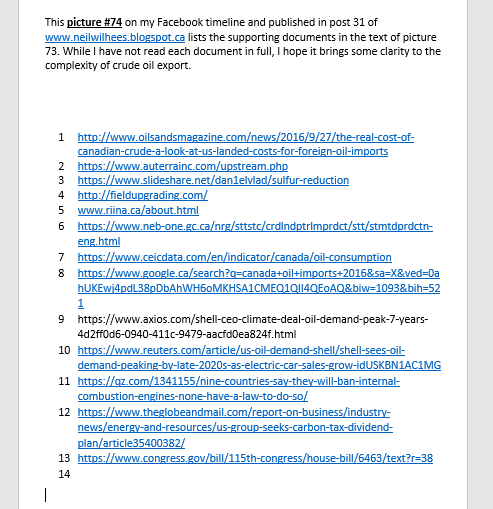 Post 12 shows that 3 major oil companies demand a global carbon tax because with their vast natural gas reserves they can kill the coal industry. 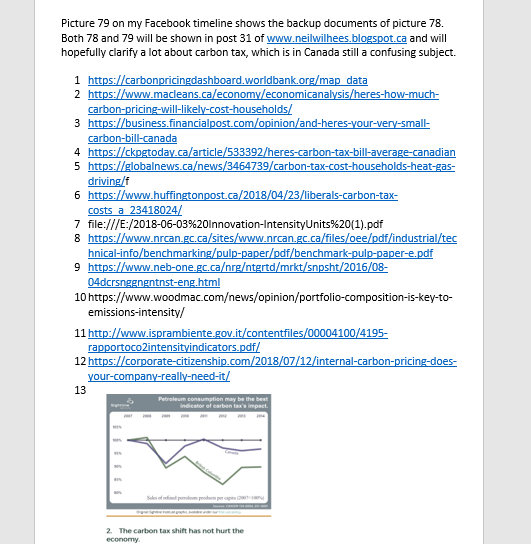 The second part analyses a speech, which the Canadian MP, Mr. Leef gave in the house, showing that he has no idea how a revenue neutral carbon tax works and that there are no MPs which can give him the correct figures on the spot. 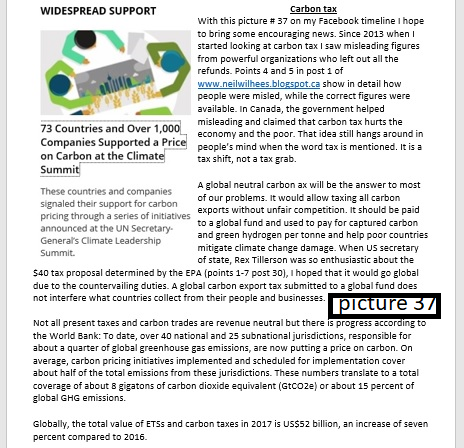 Post 19 and points F), G) and H in post 27 again show all the advantages of taxing carbon via a revenue neutral system. Points 1-7 in post 30 show how close the US can come to a global tax. Their proposed $40 tax forces countries with a lesser tax to pay import duties. China is a main target. Since all money raised will go to citizens, they shut out industries because those already will receive tax cuts. It is clear that illegal immigrants don’t get any refund. Of the 11 million illegal people 8 million work. That is 5% of the total labor force. So, it is not revenue neutral but raises the standard of living of working people. While the BC carbon tax was revenue neutral and used as an example by other countries, dangerous flaws have occurred. I have often tweeted picture 37 in reply to tweets from others. 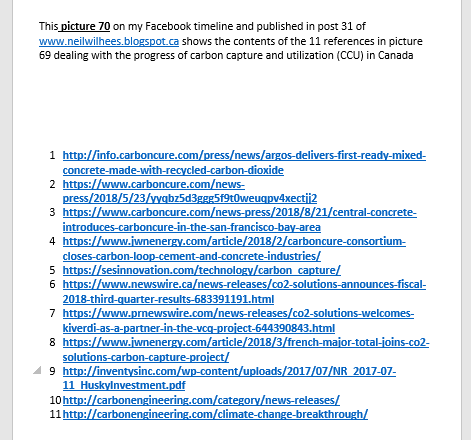 Just recently one tweeter referred to a Globe and Mail article (61) showing that pre-existing subsidies like those to the film industry and interactive digital media had been sneaked in as carbon tax refunds. Worse yet, the present provincial budget appears to scrap the law that all tax collected has to be refunded to businesses and individuals who paid for it. 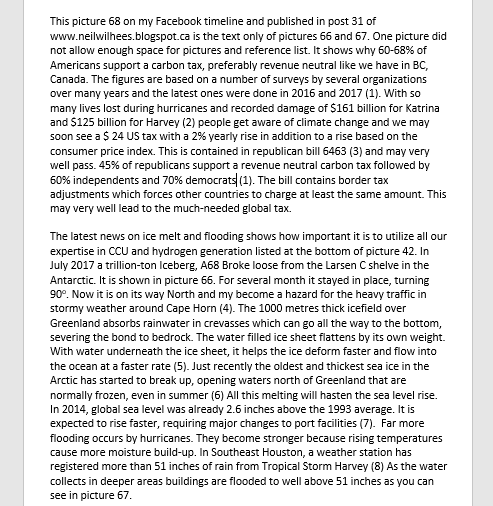 A few days later I got from another tweeter the Financial Post article (62) with a similar stora including figures and a graph to show how bad it is. Please, let’s tell the government to restore our original system. When Mr. Trudeau agreed in Paris to start taxing carbon he should in the national interest have made it a national revenue neutral carbon tax. By leaving it to the provinces we are faced with a hodgepodge of cap and trade, specific environmental projects and an array of subsidies for items like cars or solar panels, which are not necessarily what individuals want to spend their refunds on. We hope that it will result in prevention of excessive global warming.